The lively neighborhood of North Loop is known as the Warehouse District from its historical roots as Minneapolis' main commercial hub. Located between downtown Minneapolis and the Mississippi River, homebuyers can find everything from converted lofts, and condos to split-level riverfront townhome, and luxury apartments. Residents here enjoy access to a variety of great fine-dining restaurants, stylish boutiques, lively coffee shops, and specialty shops. If you're looking for a charming neighborhood close to downtown Minneapolis with lots of convenient amenities, you should consider a North Loop condo or loft. See North Loop condos & lofts for sale in Minneapolis below or learn more about the North Loop community and its amenities. The majority of housing in the North Loop is condos and loft dwellings. You'll find a combination of industrial loft space and more traditional layouts, as well as some hybrids which fall in between. There are repurposed warehouses and new construction lofts made to emulate the warehouse look. There are also a number of town homes along the riverfront area if you are considering a split-level home. Townhomes start around $400,000. One of the added benefits in living in the North Loop is that most of the area is protected by the historic society and buildings can't be over nine stories tall. As a result, high-rise buildings won't be cropping up anytime soon. North Loop residents have quick access to the LRT and bus service and are walking distance from downtown services and amenities. There's lots of great shopping along Third Avenue and Glenwood Avenue as well as at Nordstrom. Other nearby attractions include Target Field (Home of the Minnesota Twins Baseball Team), the Minneapolis Farmers Market, an antique market, art galleries and New Century Theater. The recreational opportunities are plentiful in North Loop. North Loop condos enjoy easy access to the Grand Rounds Scenic Byway, a 50 mile loop of scenic lakes, parks, bicycle paths, and walking trails. Dog owners will find a large off leash area at Dog Grounds Dog Park. 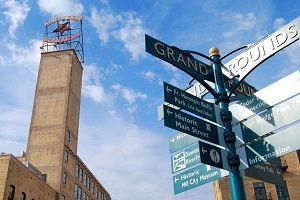 Looking for a condo, loft or townhome in Minneapolis? Get started with our comprehensive Minneapolis Condo & Loft Directory.